Wastewater Management with Water Washer Systems Manufactured by Beckart Environmental, Inc.
Water Washers from Beckart Environmental provide the perfect wastewater management solution for waste streams with low solids content or low volume. And these self-contained batch/flotation systems can do double duty, processing metals and serving as an oil-water separator for your wastewater at the same time. This makes them ideal for facilities with wastewater streams that include coolants, cutting oils and vibratory waste. 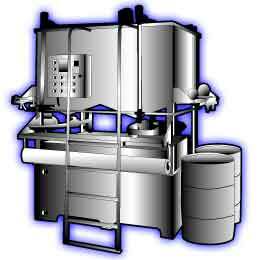 These compact units are also an optimum choice for smaller facilities, as they require only 9 to 60 square feet of floor space and treat 50 to 1,000 gallons per batch (0.2 m3 – 4.0 m3 per batch). Like all of Beckart Environmental’s batch wastewater management products, our Water Washer systems can be customized to meet any client’s specific needs. Additionally, we’ve worked with clients in a variety of industries for decades, so you can feel comfortable knowing that we are familiar with your wastewater challenges and we can use our equipment and expertise to address them. No matter what your industry, we can assess your needs and design and implement a system that provides the type of wastewater treatment you need. Beyond that, we can provide you with the proper chemical blends for your system and even train your employees to use them properly. Plus, from your very first meeting with Beckart to your final transaction with us, you’ll receive service and support from a dedicated group of associates, who are attuned to your needs and challenges. If you’d like to learn more about Beckart’s Water Washers or our other wastewater management solutions, contact us today. We serve companies worldwide.